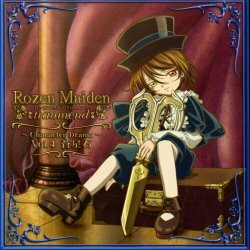 Released on November 22, 2006 was the latest in the Rozen Maiden Character Drama CD series, this volume dealing with Souseiseki. Unlike the previous installments in the series, this one seems more to expand on previous themes in the TV series, instead of presenting an entirely original side-story. It takes place around the time of Episode 4 of Träumend, with parts of it happening both a little before and after, and in it we get to see the sowing of doubt and internal conflict within Souseiseki concerning the start of the Alice Game. On the one hand, it's nice to get a little more insight into one of the otherwise more opaque personalities in the series. However, it's difficult to feel very good about the resolution of this drama, knowing how things would develop a few episodes later. Another problem for poor Souseiseki in this drama is that Suiseiseki seems to steal every scene they're in together, so it feels less and less like she's the focus of the story. Next month: Shinku's drama CD - about the same time that Suigintou's Ouvertüre special is due (talk about stealing scenes). 12/29/2006: To amend the original statement above, the Shinku drama CD has apparently been pushed back until January 24. Download a plain ASCII version (*.TXT) of the entire script here (28 KB).